At the end of Mark 2:17, there is a textual variant that has an impact on translation. Strangely, there is no indication in the textual apparatus of the 27th edition of the Nestle-Aland Novum Testamentum Graece that this contest exists. Nor is it mentioned in the UBS Greek New Testament. The Tyndale House edition of the Greek New Testament does not alert readers to its existence either. That is unfortunate, because this variant-unit is a good example of why the relative diversity of manuscript-support is more important than the relative quantity of manuscript-support. Suppose we were to encounter a tree upon which some oranges, some lemons, and one kumquat were growing, and we were to ask, “Was this originally a lemon tree, or an orange tree?” Can we find the answer by finding out whether the tree has more lemons, or more oranges? What is the original tree? Suppose we count the fruit, and learn that there are 20 oranges, and 200 lemons. Clearly the dominant fruit on the tree, when we encounter it, is lemons. 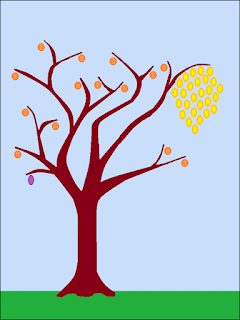 But suppose we examine the tree in more detail and notice that those 200 lemons are on a single branch of the tree. All of the other branches, though not nearly as productive, bear oranges (except for that one with a kumquat). Would you conclude that the tree, at its base, is an orange tree that has had a branch from an orange tree grafted onto it, or that it is a lemon tree that has had several branches from an orange tree grafted onto it? That situation is similar to the situation that we encounter in Mark 2:17. Most Greek manuscripts include two words – εἰς μετάνοιαν, “to repentance” – at the end of Mark 2:17. With these two words included, Mark’s record of Jesus’ words resembles the record in the parallel-passage in Luke 5:32 a little more closely. Without them, the meaning of the passage is not lost, inasmuch as Mark had already reported (in 1:15) that Jesus was calling people to repentance – but the form of the text is obviously affected. Although the vast majority of Greek manuscripts (including Codex C and Codex F and Codex M and Codex S and Codex Ω) reads εἰς μετάνοιαν, the manuscripts that do not have these two words in Mark 2:17 represent diverse branches of the text’s transmission. The flagship manuscripts of the Alexandrian text, Vaticanus and Sinaiticus, do not have these words. Neither does the fourth-century fragment Papyrus 88. Codex L, another Alexandrian witness, does not have these words either. The Bohairic version as compiled by Horner also does not have “to repentance” in Mark 2:17; Horner mentions however an Arabic gloss in one of his MSS (Copt. Arab. Rome Vat. 9, from A.D. 1205, with a colophon written at a church in Cairo in 1270) that mentions that “to repentance” is in the Greek text. But it is not as if the Alexandrian Text is singing a solo. Codex Bezae, the primary Greek witness to the Western Text, does not contain εἰς μετάνοιαν at the end of Mark 2:17. Codex W also does not have εἰς μετάνοιαν here. A few Old Latin manuscripts have the Latin equivalent of the words, but this is probably the effect of independent harmonizations to the parallel-passage in Luke; there are more Old Latin witnesses that do not mention repentance here. The Vulgate doesn’t have these words here either. uncial, ends without "to repentance." Several uncial manuscripts that are considered among the earliest and/or most important witnesses to the Byzantine Text do not support the inclusion of εἰς μετάνοιαν at the end of Mark 2:17; these include Codex Alexandrinus, Codex K, Codex Π, and Codex Υ. The Peshitta (a Syriac version, prepared no later than the late 300s) likewise does not support “to repentance” at this point. Neither does the Gothic version (translated in the 300s) as preserved in Codex Argenteus. In addition, although εἰς μετάνοιαν has enormous support among the minuscules, a small assortment of minuscules such as GA 34, 157, 1273 (the George Grey Gospels, housed in New Zealand), 478, and 700 do not include εἰς μετάνοιαν at the end of Mark 2:17. The main representatives of the Caesarean Text also do not include εἰς μετάνοιαν at the end of Mark 2:17: Codex Θ, the family-1 cluster of manuscripts, and the Armenian version support the shorter reading in this case. J. J. Griesbach, in his 1798 critical commentary on the Gospels, noted that there is a “telos” symbol in many manuscripts immediately following Mark 2:17, indicating that a lection ended here (specifically, the lection for the third Saturday in Lent). This suggests that the inclusion of the words εἰς μετάνοιαν, drawn from Luke 5:32, may have begun as a flourish with which to end two lections – one consisting of an extract from Mark; the other consisting of an extract from Matthew. The inclusion of the words is benign; it yields closer harmony among parallel accounts, and it augments the original meaning of the text. These three traits elicited the adoption of the words in the Byzantine Text (and in a few other places where independent scribes made harmonizations), albeit not so early in the Byzantine Text’s history as to affect all of its major witnesses. The absence of the words in such diverse manuscripts cannot be explained easily if these words were originally part of the text of Mark 2:17; meanwhile their adoption by scribes familiar with the parallel-passage in Luke 5:32 can be accounted for as a harmonization. Thus, it should be concluded that the words εἰς μετάνοιαν were not part of the original text of Mark 2:17. As a closing note, I think it should be stressed that the neglect of this variant in the Nestle-Aland and UBS textual apparatuses (and the apparatus of the Tyndale House edition of the Greek New Testament as well) is a shortcoming that ought to be rectified. Practically all Greek Gospels-manuscripts that do not read εἰς μετάνοιαν in Mark 2:17 are manuscripts of special importance. It appears you are saying that when it comes to lexically influenced changes to the text, Byzantine scribes were much more likely to insert then to delete. Acts 8:37 being a notable exception, as it played out over time. The difficulty of distinguishing which verse is being quoted by the Fathers is an obstacle to establishing this text using the Fathers. I did a cursory search and came up with some early quotes of these texts. In most cases it is really a coin flip which gospel is being quoted and leaving off "to repentance" is hardly unusual when the emphasis is about "call sinners to repentance". There is much more concerning the Greek of these verses, but Mark and Matthew (for this phrase) are exactly the same (TR : KJV). Epiphanius of Salamis is obviously quoting Matthew, but other Fathers it is not clear which gospel. ANF has one instance where they list both Mark & Luke as a reference for the quote. Much thanks for your excellent blog/ newsletter. • Οὐ χρείαν ἔχουσιν οἱ ἰσχύοντες ἰατροῦ, ἀλλ’ οἱ κακῶς ἔχοντες. • οὐ γὰρ ἦλθον καλέσαι δικαίους, ἀλλ’ ἁμαρτωλοὺς εἰς μετάνοιαν. But when Jesus heard that, he said unto them, They that be whole need not a physician, but they that are sick. 13But go ye and learn what that meaneth, I will have mercy, and not sacrifice: for I am not come to call the righteous, but sinners to repentance. • οὐκ ἦλθον καλέσαι δικαίους, ἀλλὰ ἁμαρτωλοὺς εἰς μετάνοιαν. • οὐκ ἐλήλυθα καλέσαι δικαίους, ἀλλὰ ἁμαρτωλοὺς εἰς μετάνοιαν. They that are whole need not a physician; but they that are sick. Chapter VIII. Does the body cause the soul to sin? εἶπε δὲ οὕτως· οὐκ ἦλθον καλέσαι δικαίους, ἀλλὰ ἁμαρτωλοὺς εἰς μετάνοιαν. θέλει γὰρ ὁ πατὴρ ὁ οὐράνιος τὴν μετάνοιαν τοῦ ἁμαρτωλοῦ ἢ τὴν κόλασιν αὐτοῦ. οὐκ ἦλθον καλέσαι δικαίους, ἀλλὰ ἁμαρτωλοὺς εἰς μετάνοιαν. Άγιος Ιωάννης ο Χρυσόστομος. (John Chrysostom, PG 47 – 64). the graciousness of Christ’s advent. Οὗτος τοίνυν ὁ Ματθαῖος καταξιοῦται τὸ εὐαγγέλιον, ὡς ἔφην, καὶ δικαιότατα ἦν. ἔδει γὰρ τὸν ἀπὸ πολλῶν ἁμαρτημάτων ἐπιστρέψαντα καὶ ἀπὸ τοῦ τελωνείου ἀναστάντα καὶ ἀκολουθήσαντα τῷ ἐλθόντι ἐπὶ σωτηρίᾳ τοῦ γένους τῶν ἀνθρώπων καὶ λέγοντι «οὐκ ἦλθον καλέσαι δικαίους, ἀλλὰ ἁμαρτωλοὺς εἰς μετάνοιαν», εἰς ὑπόδειγμα ἡμῖν τοῖς μέλλουσι σῴζεσθαι τῷ ἐν τῷ τελωνείῳ ἀναχθέντι καὶ ἀπὸ ἀδικίας ἀναστρέψαντι, παρασχέσθαι τὸ κήρυγμα τῆς σωτηρίας, ἵνα ἀπ' αὐτοῦ μάθωσιν οἱ ἄνθρωποι τὴν τῆς παρουσίας φιλανθρωπίαν. Williams : PDF : Book II & III : p. 29-30. Hieromartyr Cyprian, Virgin Martyr Justina and Martyr Theoctistus suffered for Christ at Nicomedia in the year 304. Saint Cyrian then first tested for himself the power of the Sign of the Cross and the Name of Christ, guarding himself from the fury of the enemy. Afterwards, with deep repentance he went to the local bishop Anthimus and threw all of his books into the flames. The very next day, he went into the church, and did not want to leave it, though he had not yet been baptized. χωρεῖν ἀνθρώπινον λογισμὸν τὸν λόγον τῶν γενομένων.